This deck is simple: it wants to get a big Epic Experiment, and then to copy that big Epic Experiment multiple times, first through Riku or a copy spell in-hand, and then through the Epic Experiment's casting itself. The deck's central combo isn't infinite, but given enough mana and luck, it can chain itself for a long, long time. The basic gist of it is this: if there are two Epic Experiment castings on the stack (say you copied it with Riku), then when the copy turns over copy spells (such as Twincast, those spells are able to target the original, unresolved copy of Epic Experiment still on the stack. 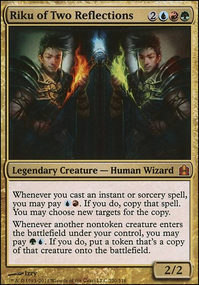 With enough of these copy spells and a big enough number for Epic Experiment's X, a long chain of instants and sorceries follows, and the deck is built around extending this chain, optimizing it, and making it happen in the first place. For ramp, the deck has the usual culprits: Sol Ring, Farseek, Cultivate, et cetera. There's not a lot of artifact ramp in here because the deck really wants to get spells more than anything else, but Arcane Melee and Semblance Anvil are in because of the scaling benefits mana cost reductions give. For the chain extension, there's a few tools in there: there's the familiar copy spells such as Twincast, Reverberate, and Reiterate , but there's also a lot of turn-taking spells too; Time Stretch, Beacon of Tomorrows and all of the other extra-turn spells help me get the chain back in motion if it breaks on me. To that end, Archaeomancer and friends usually restock the Epic Experiment and the chain is free to start anew. The deck actually wins by using storm cards to close out the game. Epic Experiment's X can often reach lofty heights; with X=15, with the copied chain going on it's not uncommon for the Experiment to chew through nearly the entire deck, and that equals a ridiculous Storm count. Volcanic Awakening, Grapeshot and Ignite Memories are all capable of either winning outright or setting opponents so far back that they have little hope of recovery. Lastly, there's the ancillary cards that help the deck function but don't directly contribute to its win strategy. Psychic Spiral alleviates my self-mill concerns, while Devastation Tide, Blasphemous Act and other field-wipes make sure I can survive until the big time comes. This deck is a blast to play and was fun to make. While casting a copied Epic Experiment is usually scoop-worthy, leading up to that point the deck has a lot of tricks up its sleeve, such as using its copy spells to gain an advantage or gleefully casting Blasphemous Act at instant-speed with Hypersonic Dragon. It's hard to beat waiting for someone to play a big ol' self-targeting spell with a Wild Ricochet in-hand.